A LOOK BACK: Proving God? This past weekend I took my girls to the theater to see the latest Christian film to hit the big screen. 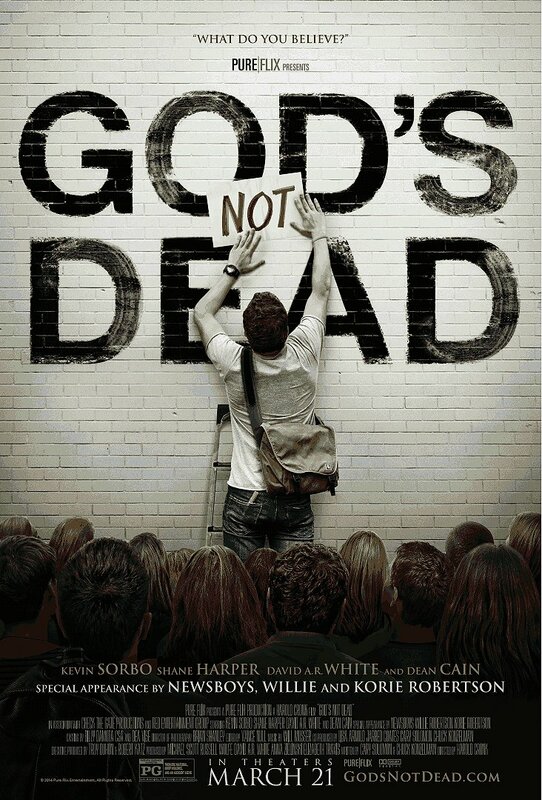 The film is called “God’s Not Dead” and it is about a freshman in college who enrolls in a philosophy class. At the beginning of the class the professor tells the students that he’d rather not waste time on discussing the age old question of whether or not God exists. He lists a ton of academics who have all determined that God does not exist and states that it would be better to move on to other things, rather than rehash the topic of God’s existence. Being that the professor believes the debate to have been won by the atheistic academics, he asks the class to write “God is Dead” on a piece of paper and sign their name to it. If the whole class does, great…they can move on. There’s just one problem, the aforementioned freshman is a Christian and he is not willing to write “God is Dead” and sign the paper. Because of that the professor challenges the student to utilize three classes to prove the antithesis of that statement. In other words, the student needs to prove that God’s NOT Dead and he needs to convince the class who have all signed off on God being dead. Of course, following that last statement, the student continues throughout the course of the film trying to “prove” that God does exist. And, to be fair, there wouldn’t have been a film if he didn’t. Actually, to be doubly fair, the film is about more than just the student trying to prove God. Yet, the reality is that he should have left it with just that: “I cannot prove that God exists and you cannot prove that God does not exist.” Yet, he feels the necessity to try and prove. I am not one to shy away from such debates. A good discussion on the existence of God tickles the fancy of philosophical minds, and I certainly have one of those. In fact, it is because I have engaged in such discussions that I have come to the realization that trying to prove “God” to people who are trying to disprove “God” to you is a fruitless endeavor. Rather than trying to prove God exists, be living proof that God exists. In other words, don’t waste your time on fruitless words about God, as if God can be fully explained and proven by our words. If you believe in God, if you are a person of faith, then you will do as your faith dictates. If you believe in God you will live a life of love, a life of compassion, a life of justice and a life of mercy. You will live your life in a way that reflects your beliefs. Today’s challenge is to stop trying to prove what you believe. To quote my mom, you don’t need to prove anything to anyone but God. If you believe in God, then live according to your beliefs. That will go a lot further than words do. When people see you living a life that reflects the reality of God, that will be a greater witness to God’s existence than anything you can say in a fruitless debate. Be at peace in your faith and live according to it. Lord, I believe in you and know you have called me to live out my beliefs. Guide me in that direction and equip me for your work. Amen.